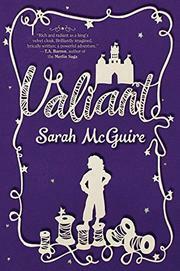 Valiant, by Sarah McGuire (Egmont USA, April, 2015), is a pleasing fairy tale retelling (of The Brave Little Tailor) for older middle grade readers who just venturing YA-ward (which is to day, ages 11-14). Saville is the daughter of an extremely skillful tailor, but no matter how hard she has tried to be good, and no matter how straight her seems are sewn, he loves his silks and find cloths more than he cares for her. He is determined to become tailor to the king, but is laid low with a stroke just as he and Saville are about to arrive at the capitol city. With no other obvious way to look after him and herself, Saville disguises herself as a boy, and assumes the identity of his assistant. She succeeds in winning the king's approval, and is able to support her father, and a young orphaned boy, Will, who she cares for deeply. In the meantime, Saville finds herself falling in love with the king's cousin, Lord Verras, working with him to try to keep the kingdom from falling to the giants and their evil duke. In the end, it is not any feat of strength that saves the day, but Saville's intelligence and ability to conceive of the giants not as monsters, but as people. It is not the fastest read ever, especially the first half or so; I found myself able to put it down without pain, but I kept coming back to it. I liked Saville very much--she is a very decent, thoughtful person, motivated by love, and although some readers might be disappointed that her romance with Lord Verras does not burn as brightly (and take over the story) as much as the romances do in many YA books, I found it satisfying (although I find myself wondering how things will work out long term, because of the class difference--her a tailor's daughter, him a lord; I can imagine this causing tension down the line....), and likewise, some might be disappointed that Saville doesn't actually DO much beyond figuring things out, but since I enjoy ancient stories holding the solution to problems more than I enjoy people whacking each other with swords, this was fine with me. McGuire does a nice job twisting the original tale with added nuance and emotional heft. In short, a pleasant one for fans of fairytales; I'd offer this one to those who enjoy Jessica Day George's books about the 12 Dancing Princesses in particular. Here's the Kirkus review, which pretty much matches my own opinion. Hmmm... I do love fairy tale retellings, but I haven't liked George's books. I shall go over and check the Kirkus review.